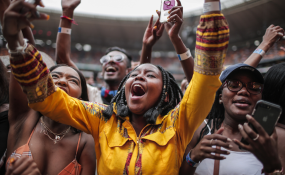 Nigerian music stars, Wizkid, Tiwa Savage, D'banj and Femi Kuti thrilled music lovers in South Africa alongside Oprah Winfrey, Jay-Z and Beyonce. While Wizkid, Tiwa Savage and Femi Kuti performed powerful renditions of their hit songs, D'banj came alive on stage with a medley and performance that took fans down memory lane. The highlight of the festival was the performance by music couple, Beyonce and Jay-Z. The duo came on stage shortly after Oprah's moving speech. The couple emerged in stunning new costumes and opened with a soul-stirring rendition of Jay-Z's hit song, 'Holy Grail'. While the duo changed into new costumes, a video montage of Mandela and Jay-Z's trip to Angola and South Africa in 2006 played in the background. They returned to the stage to perform 'Apeshi' from their joint album before bringing out surprise guests Pharrell Williams and Ed Sheeran, who performed 'Perfect Duet' alongside Beyoncé. In 2015, the organisation announced that Coldplay lead vocalist Chris Martin would serve as the festival's curator for the next 15 years.